Networking can be a complex topic, especially for those new to the field of IT. This focused, full-color book takes a unique approach to teaching Windows networking to beginners by stripping down a network to its bare basics, thereby making each topic clear and easy to understand. Focusing on the new Microsoft Technology Associate (MTA) program, this book pares down to just the essentials, showing beginners how to gain a solid foundation for understanding networking concepts upon which more advanced topics and technologies can be built. 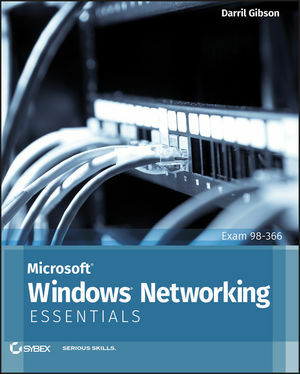 If you're new to IT and interested in entering the IT workforce, then Microsoft Windows Networking Essentials is essential reading. Darril Gibson, MCSE, MCITP, ITIL v3, Security+, CISSP, is the CEO of Security Consulting and Training, LLC. A Microsoft Certified Trainer since August 1999, Darril regularly teaches, writes, and consults on a wide variety of security and technical topics. He has authored, coauthored, or contributed to 14 books on a wide range of topics that include Windows Server, Windows 7, SQL Server, and IT security. The header of the third column, "Subnet Values" should read "Subnet ID". In the column headed "Four IP Ranges", the second and third entries are incorect. and "192.168.1.129-191" should read "192.168.1.129-190"
Under Subnet B, the range "192.168.1.65 to 192.168.1.127" should read "192.168.1.65 to 192.168.1.126"
Under Subnet C, The Network ID should read "192.168.1.128 / 26"
and the range "192.168.1.129 to 192.168.1.191" should read "192.168.1.129 to 192.168.1.190"
The "Subnet mask value" column in the three tables is in error. 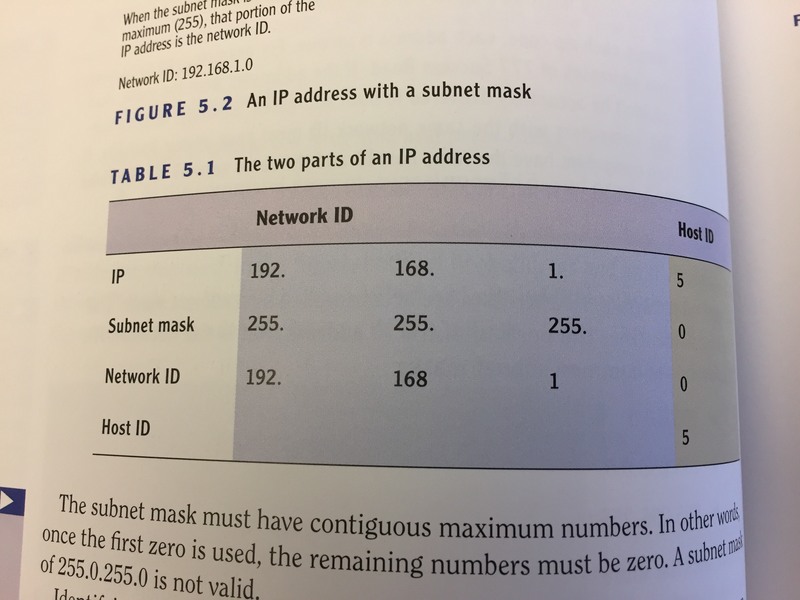 The correct subnet masks are listed below, by table. In the IP address converted to binary (first string of binary, in red) the last octet is incorrect. "0000 0001" (first two digits in red) should read "0100 0001". In the binary Network ID, the third octet "0000 0011" is incorrect. It should read "0000 0001". 7 135-137 Text/Figure corrections: Errors under "Avoiding Power Spikes"
Change the second sentence of first paragraph following the sidebar on page 135 to read "This sine wave cycles at a rate of 60 Hertz (Hz). One Hz is one cycle per second so 60 Hz is 60 cycles per second but only two cycles are shown in the figure." Question 6 reads "True or false. Windows Server 2008 server supports RIPv2 and OSFP routing protocols". Please change to ?Windows Server 2008 supports?? Question 8 starts with "True or false", but then goes on to give 4 choices of what I would add to allow multicast IP traffic through the router. That's not a true or false question. 11 220 Text correction: Error under "Botnets and Malware"
Incorrect: Sentence reads, "In binary form, the full IP address is 1100 0000 . 1010 1000 . 0000 . 0001 . 0000 0101. Correct: It should read, "In binary form, the full IP address is 1100 0000 . 1010 1000 .0000 0001 . 0000 0101. Sentence ? "Additionally, you need to ensure that all the sales computers are connected only to ports F0/0 through F0/12." The 'speed' for 802.11n is stated as 300 Mbps. There are two errors in this table. (a) In the row identified as 'PPTP' it states its port as 1701. The port should be stated as 1723. (b) In the row identified as 'L2TP' it states its port as 1723. The port should be stated as 1701. On the diagram, seek and find 'PC-5'. Its IP address is wrong.